Pertaining to or characterized by hallucinations, distortions of perception and awareness, and sometimes psychotic-like behavior. A drug that produces such effects. An art style influenced by the prevalence of hallucinatory drugs, especially LSD, with typical designs featuring abstract swirls of intense color with curvilinear calligraphy reminiscent of Art Nouveau. The psychedelic movement began in the mid 1960’s and had an effect, not just on music, but also on many aspects of popular culture. This included style of dress, language and the way people spoke, art, literature and philosophy. The visual motifs of psychedelic art include Art Nouveau-inspired curvilinear shapes, illegible hand-drawn type, and intense optical color vibration inspired by the pop art movement. The end of WWII in 1945 brought about a post-war economic boom in the U.S. It also brought about an enormous spike in the birth rate, known as “the baby boom.” Between 1945 and 1957 nearly 76 million babies were born in America. By the middle 1960s, most of these kids were young adults. As young people do, these “baby boomers” questioned America’s materialism and conservative cultural and political norms. During the 1960s a youth movement emerged, seeking to create an egalitarian society free from discrimination. The feminist movement and the Black movement are a direct result of this evolution. 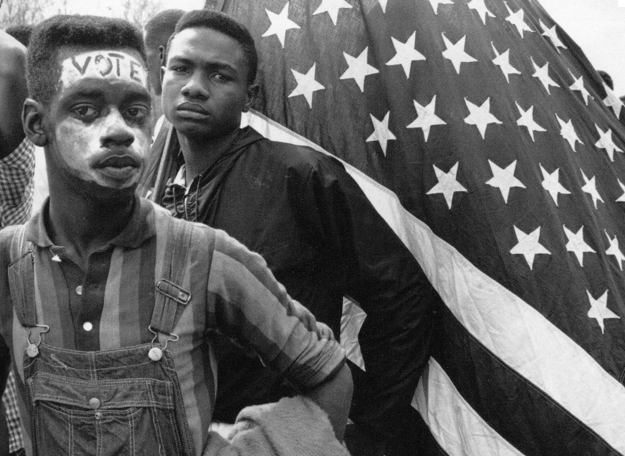 Americans in the 1960s and 70s addressed many controversial issues — from civil rights, the Vietnam War, nuclear proliferation, and the environment to drug use, sexual freedom, and nonconformity. Many youth sought spiritual experiences through Eastern Mysticism and psychedelic drugs. Music festivals and concerts were a prominent feature of the 60s landscape, and musicians such as Jimi Hendrix, The Grateful Dead, The Who, Janice Joplin were the super-stars of the day. It’s hard to say whether psychedelic music influenced the counterculture or vise versa. But a unique artform found expression in band posters and album covers. 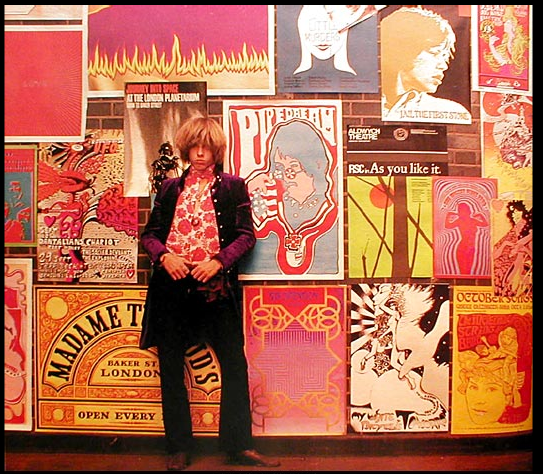 1967 was the peak year for psychedelic rock. It gave us Sgt. Pepper’s, debut albums by Jimi Hendrix, The Doors, the Grateful Dead, and the Monterey Pop Festival. It was also The Summer of Love, the counter-cultural phenomenon where nearly 100,000 young people arrived in San Francisco’s Haight Ashbury district to celebrate music, art, and life. It was the year where just about everyone tried to make a psychedelic rock record, from obscure underground bands to bubblegum pop groups. Even Sonny Bono! View the album artwork and listen to the music on Brooklyn Vegan’s 50 best psychedelic rock albums of the Summer of Love. 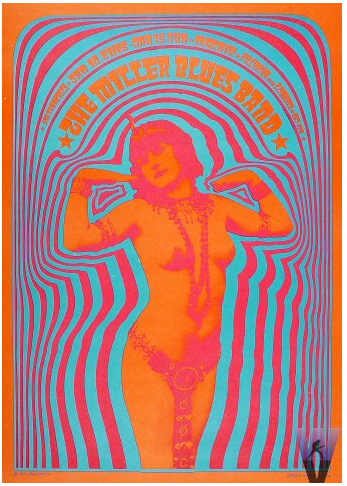 Wes Wilson was one of the best-known designers of psychedelic posters. 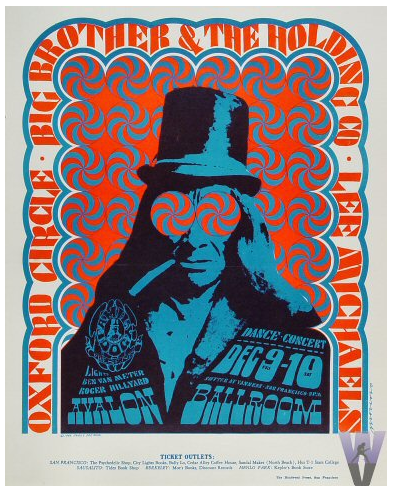 Most well known for designing posters for Bill Graham of the The Fillmore in San Francisco, he invented a style that is now synonymous with the peace movement, psychedelic era, and the 1960s. 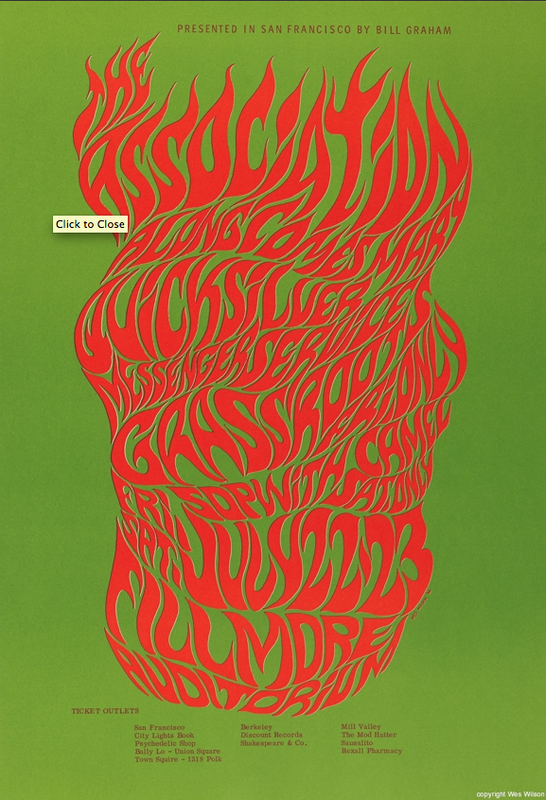 In particular, he is known for inventing and popularizing a psychedelic font around 1966 that made the letters look like they were moving or melting. Moscoso was a formally trained graphic designer who borrowed from comic books, Victorian images, Art Nouveau, and pop art. He used the concept of vibrating colors to create the ‘psychedelic’ effect in many of his pieces. The vibration is achieved by taking colors from the opposite end of the color wheel, each one having equal value (dark to light) and intensity (brightness). Op art, short for Optical art, is a style of abstraction that relies on geometric shapes, lines, and color juxtapositions to create optical illusions for the viewer. Gaining popularity in the 1960s, such art often features patterns, grids, and effects like curving or diminishing objects. 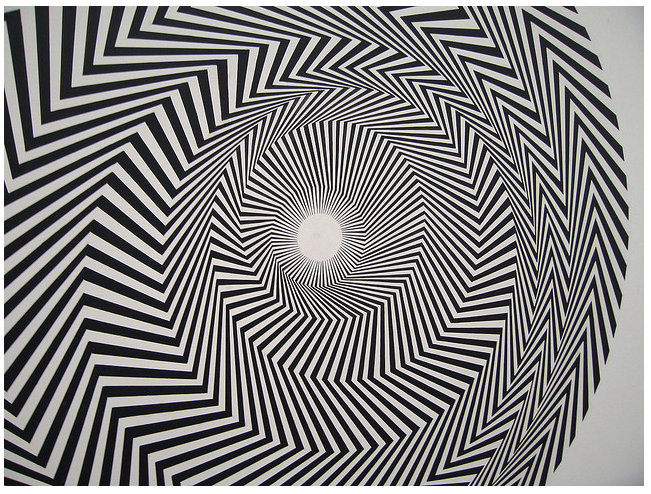 The Op art movement was driven by artists who were interested in investigating various perceptual effects. “Pop” was a term first applied to popular culture rather than to art, but it would be one of the goals of the Pop art movement to blur the boundaries between ‘high’ art and ‘low’ popular culture. Pop Art was one of the United States’ major artistic movements of the 20th century. It actually was first coined in Britain in 1955 but unsurprisingly the Americans took up the consumerist cause with much greater effect and conviction, and became the pioneers of the movement. Pop art and pop culture refers to the products of the mass media evolving in the late 1950s and 60s and also to the works of art that draw upon popular culture: packaging, television, advertisements, comic books, the cinema. Pop art attempted to break down the barriers between high (old-fashioned) art and contemporary culture. Pop Art emphasized the kitschy elements of popular culture as a protest against the elitist art culture and the seriousness that surrounded it. It marked a return to sharp paintwork and representational art. It glorified unappreciated objects and ordinary business. In doing so, it aimed to make art more meaningful for everyday people and came to target a broad audience. Although it gained many supporters for the way it was easy to comprehend, critics saw pop art as vulgar. Pop Art made its way to the United States in the 1960s with the help of ground-breakers Jasper Johns and Robert Rauschenberg. Roy Lichtenstein became a household name for the way he used stencil-like dots, thick lines, bold colors, and thought bubbles to represent the comic book style. His paintings were the size of billboards. 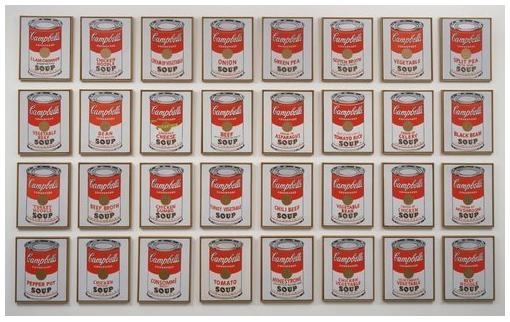 Andy Warhol became the most famous American pop artist when he used an industrial silkscreen process to paint such commercial objects as Campbell’s soup cans and Coca-cola bottles and for portraying major celebrities like Liz Taylor, Jackie Kennedy, and Marilyn Monroe. As Warhol and Lichtenstein brought together elements of sign painting, commercial art and literary imagery in their work, they became renowned for erasing the boundaries between popular and high culture. There is agreement among historians that the 1960’s witnessed some of the most significant cultural changes in the 20th century. As Jann Wenner, founder of Rolling Stone Magazine put it …. I am researching a collection of anti-war posters and prints created by a then-student at Berkeley in the late 1960s which her estate is donating to the library of the University of Victoria. 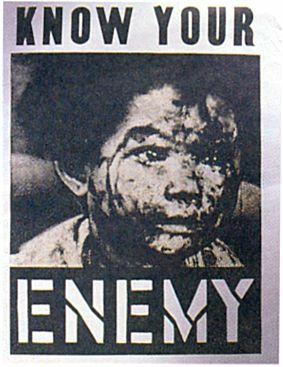 In particular, there is a print of the poster “Know Your Enemy” which is featured in your bog about the psychedelic sixties. It is unsigned and I am searching for any further information about it. I would also like to discuss a number of other images in this collection and look forward to opening communication with you. Thanks Bruce. I don’t know much about the surf art of the 60s, but it sounds like a fascinating topic to research. Your website is easy to read and I put it on my sources library already! lol, it is helpful for the basic research of design history. You are absolutely right Leo! I remember how popular his commercial artwork was – I particularly remember his work appearing on packaging and television commercials. Thanks for pointing out my oversight. 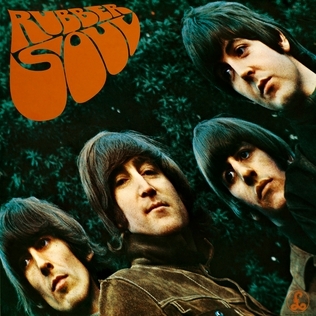 I’m trying to find who first made this style, not who drew that version for the beatles. The style of the bottom half being fatter was already being used all all over the western world at that time. I don’t know who first did it. http://rodmckie.blogspot.com/2010/08/things-you-didnt-know-you-didnt.html (thanks to Rod McKie’s blog). Great read. Love the helpful amount of provided information! Love the post it is exactly what I was looking for! I got here by browsing for psychedelic pop concepts and aesthetics, and your post is really useful! Thx. I am a child of the 60s. Iam also an artist greatly influenced from the time. 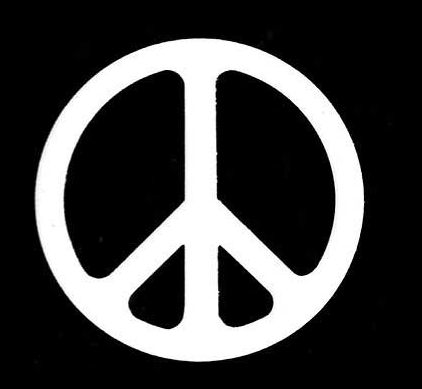 The hippie culture still gives me hope that people can live in peace. Thanks for the link you your page on the 60’s – it’s excellent. Tim Hodgetts, you are right. The quest to awaken the mind and discover new realities were (and still are) the reasons for the use psychedelics. My definition was meant to describe “psychedelic” in terms of an artistic style – I neglected to explain the why behind the what. Thank you for your comment. The word Psychedelic comes from the latin word “psyche”, meaning mind, and the greek word “delos”, which means to manifest, or awaken, so there you go, psychedelic means “to awaken your mind”. I’d have thought you clever so and so’s would have known that, but then what can you expect from todays dumbed down academics? it. Tone style and design needs to be fun really not a task. This is a wonderful and informative article! Thanks for the great work! I am not positive the place you are getting your information, however great topic. I must spend some time learning more or working out more. Thank you for excellent info I used to be on the lookout for this info for my mission. Have you ever considered writing an e-book or guest authoring on other websites? I have a blog centered on the same information you discuss and would love to have you share some stories/information. I know my subscribers would appreciate your work. If you are even remotely interested, feel free to send me an e-mail. Hi there! I just wish to give an enormous thumbs up for the nice information you’ve got here on this post. I shall be coming back to your weblog for extra soon. Good day! I just want to give a huge thumbs up for the good information you could have here on this post. I might be coming back to your weblog for extra soon.